The drive for Power over Ethernet (PoE) started over decades ago. At first, Voice over IP (VoIP) needed power from a separate source. The simple DC power of Plain Old Telephone Service was missed. PoE answered the question of how to provide power and data over a single cable, simply and dependably. Early proprietary solutions for PoE gave way to standards based ones after IEEE 802.3af was finalized in 2003. The standard provides for 15 Watts at the source, at a nominal 48 VDC. Key devices are Power Sourcing Equipment (PSE), usually a PoE enabled switch at one end and a Powered Device (PD) at the other end. The reliability and cost effectiveness of providing both data and power over a single cable are improved with PoE. PoE has become a clear choice in multiple applications. PoE is an practical technical solution. As Ethernet-TCP/ IP has become common in control rooms and network backbones and access links, PoE has expanded the use of Ethernet on the factory floor. Cost - Using one cable for both data and power to industrial devices is cost effective – for both installation and maintenance. The cost to run a power cable can be $10 to $100 USD a foot, and changes may be frequent. Safety - PoE is a safe power solution. Maximum voltage is under the limit for “high voltage” applications. To avoid damaging devices or accidental contact with even this relatively safe level, the PSE sends a 10 Volt test current to verify there is a 25 Ohm resistor at the PD before full power is applied. If the PD stops using power, power from the PSE stops and testing resumes. Over-current, under-current and fault protection are also part of the PoE standard. Flexibility - PoE is standards based, so interoperability across vendors is guaranteed. All variations of network topologies can be configured with PoE, including ring, mesh and other networks. Plus, industrial network management tools such as RSTP/STP, IGMP and VLANs are available on the high quality industrial PoE switches. 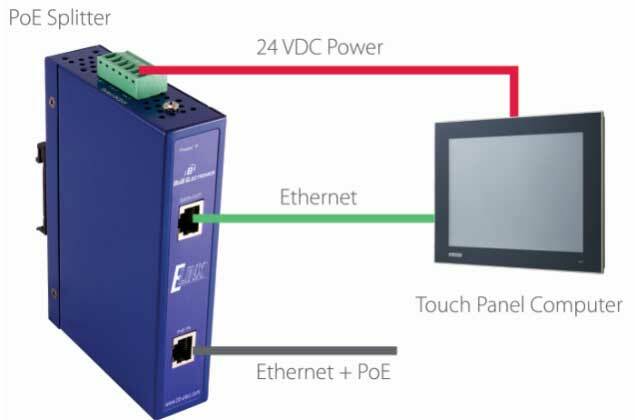 Single-cable power and data delivery, typical in fieldbus networks, is available with PoE. Plus, configuration changes on the factory floor are made simple by PoE. It makes sense to do it with a single cable instead of two, where possible. If the end device is not designed for PoE, a PoE splitter can provide separate outputs for power and data. Midspan PoE injectors can also inject power where a switch was not designed to do so, but are less common now that industrial grade PoE switches are so available. Reliability - PoE is one means of providing power source redundancy. When added to the ability to configure Ethernet for redundant data configurations, it is a powerful combination. The complexity of combining various networks often requires more equipment, programming and maintenance. A single network is simpler and has real advantages. Systems Integration - A simple interface, with multiple systems and locations managed via graphic interface, is a powerful lure that Ethernet makes possible – and PoE enhances the potential. Security – IP surveillance cameras use large amounts of bandwidth, and can greatly benefit from PoE and its scalable backbone topologies. With the ability to also provide power and control to gate entry systems, PoE is ideal for any automated security system. RFID/Infrared – From infrared bar code readers to Radio Frequency Identification (RFID), devices that track components, assemblies and people have many industrial uses. Inventory control, material flow and security options are enhanced. PoE makes it easy to place readers in more places, faster and for less. Wireless Access Points – Wireless can be the means of implementing many systems more flexibly. From Bluetooth technology to 802.11 standards, if something is moving or cannot easily be wired, PoE expands options for optimal placement of the last wired link. Interconnectivity/Accessibility – Ethernet provides connectivity and backbone service. As PoE extends Ethernet closer to the factory floor, the best of both serial/bus and TCP/IP worlds come together. Power Backups – Devices such as I/O modules and PLCs already have Ethernet links, but power needs can be so high PoE is not possible. PoE power of control and communication modules helps with backup, continuity and orderly shutdown if primary power fails. • Battery chargers for phones, PDAs, etc. While PoE is capable of direct linking with every device, the best solution involves factors such as data, power and cost. Complex devices such as Human Machine Interfaces (HMI), optical sensors and level measurement devices are the most likely current applications for PoE. Many end devices have a very simple data interface. It does not take much data flow to trip a switch or read a basic pressure or temperature sensor. Equipping simple devices with the processing power to connect direct to the Ethernet, plus the expense of needing a separate port for each device, make this choice easy in most cases. For most edge devices the final link will continue to be serial. 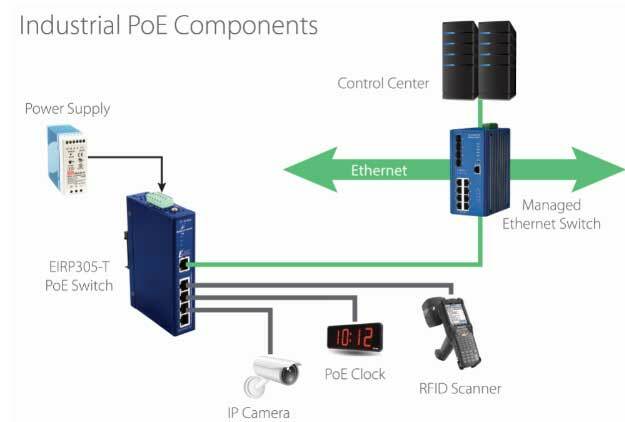 PoE is an important piece in the puzzle of full industrial Ethernet. Wider implementation will come when volume of devices, technical progress of components and prices come together to make it a logical choice. The 802.3af PoE standard is perfectly adequate for network devices that require no more than 13 Watts of power, but many devices require more power than the base standard supplies. While the cables and connectors themselves can handle more power, not all high power systems were compatible with the 802.3af standard. Increased Electrical Power - PoE + almost doubles the amount of electrical power available to powered devices, up to 25.5 Watts. Compatible with 802.3af PoE – PoE+ switches and injectors will are compatible with standard PoE devices. PoE + powered devices can also be connected to standard PoE switches or injectors and will restrict the power they use appropriately. Smart Power Budgeting – PoE+ allows both power sources and powered devices to communicate with each other to balance the availability of electrical power. With the added power of PoE +, devices such as Pan- Tilt-Zoom security cameras, thin clients, video phones and WiMax transmitters can be connected. PoE will also expand to more of the factory floor, making it possible to power a broader range of network equipment and edge devices from a single PoE port. Note: The PoE+ (802.3at) standard exists alongside the PoE (802.3af) standard; it does not replace it. PoE will still be employed by the majority of Power over Ethernet devices. In 2013, IEEE began the official study group for PoE ++, (802.3bt) a high wattage PoE solution designed to deliver 60 – 100 Watts of power. The IEEE is also exploring the standardization of PoE with 10GBASE-T (10-GBEthernet). PoE is a case of relearning old lessons. There is much to be admired about a technology that works well without problems or questions about its safety for many years. Take the track record of PoE, add the fine tuning of the IEEE and potential for a stable, scalable platform for years to come, and it is just the thing to make an engineer, plant manager or technician grin from ear to ear. Stability, reliability and inherent ruggedness of the technology are the real reasons for this potential. That’s what makes PoE a preferred candidate for full scale adoption in industrial settings. It is more important than bandwidth. If that is all there was, PoE would likely remain outside the core of industrial networks for a very long time.